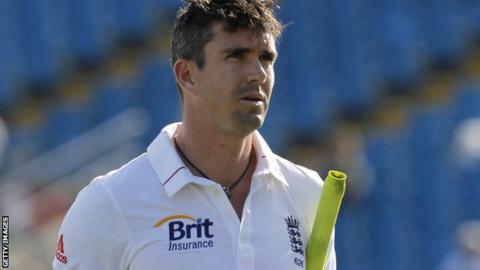 Kevin Pietersen met with England team director Andy Flower on Saturday to discuss his international future. The batsman, 32, was dropped for the third Test against South Africa for reportedly sending text messages about team-mates to rival players. Pietersen has since apologised and spoken with Andrew Strauss before and after his resignation as Test captain on Wednesday. "If Pietersen doesn't show genuine remorse over his part in a series of gauche actions and also show credible commitment to England over the next couple of years, then England's head coach won't be able to recommend further talks with Pietersen. "Pietersen will have to listen, take the criticism on the chin and not offer excuses this time. He will be able to offer his side of the story in later meetings, but Saturday is about looking Flower straight between the eyes and eating the humblest pie of his career." New Test captain Alastair Cook will be kept updated about the talks. "It may be that Strauss will act as honest broker," said BBC Radio 5 live's Pat Murphy. "Although he has no desire to have a direct role, his stature will carry weight if his opinion is sought. "I think Pietersen would have to show a total commitment to England until the next World Cup in 2015, then show his trust in Flower by allowing the coach to manage his workload while indulging his affection for the Indian Premier League to a certain extent." England have time to solve the situation because they do not need to name their Test squad for the tour to India until early October. If talks between Pietersen and Flower go well, it is expected that discussions will be scheduled between the player's advisors and Hugh Morris, the managing director of England cricket. Morris stated earlier this week that he was keen for talks with Pietersen. "We will be seeking discussions," he said. "They will be behind closed doors." Cook, who succeeded Strauss as Test captain this week and is currently involved in the says he plans to get involved in discussions "in the coming weeks". "If Pietersen comes back into line and the players are convinced of his sincerity, then most of them would surely play alongside him again," added 5 live's Murphy. "He would help them win matches." Giles Clarke, chairman of the England and Wales Cricket Board, reiterated his desire for any further talks to be kept private. "There has been too much in the public domain," said Clarke. "These matters need to be dealt with by the captain, head coach and national selector." Despite apologising for what he described as "provocative" messages, Pietersen was left out of England's squad for the World Twenty20 tournament later this year. Strauss, who had been England captain since 2009, said his retirement was made "in the best interests of himself and his team" and denied the Pietersen issue contributed to his decision. However, Michael Vaughan, who captained England between 2003 and 2008, felt it was a probable "tipping point". "I don't think it had a massive impact but I think it adds to it," said Vaughan. "It was probably the tipping point for Andrew to make the decision to leave the game."